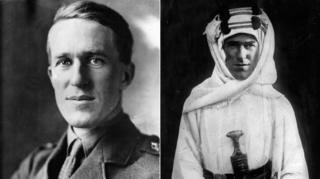 The picture most people have of the writer TE Lawrence is the version of him in David Lean's film Lawrence of Arabia. But that was more than half a century ago and playwright Howard Brenton thinks there are things to say about Lawrence which make him relevant today. Lawrence was part artist, part man of action, hungry for public acclaim yet uneasy about his own inner self, he says. Brenton, who built his reputation as one of Britain's most political playwrights, insists his new play at the Hampstead Theatre, Lawrence after Arabia, didn't start out as a political statement. "I'm in my mid-70s and I've been writing for 50 years. As a writer at my age you begin to think of first and last things. I was fascinated by Lawrence's character and the divided loyalties he felt as a British army intelligence officer who was also a supporter of Arab independence. It broke him apart. "In 1916 he played a role in the Arab Revolt against the Turks. And if you look at that now you have to think about how the way the great powers - basically Britain and the French - divided up Arabia shapes the world even today." So audiences may be surprised to discover that much of the new play takes place not under desert skies but inside the solid Hertfordshire home of Irish playwright George Bernard Shaw and his wife Charlotte Payne-Townshend. For some time Lawrence was a regular visitor to the house. Though most commentators assume he was gay, a complex relationship arose between him and Payne-Townshend (played by Geraldine James) which is in many ways the heart of the play. Lawrence, like Payne-Townshend, had been a child of the Anglo-Irish upper class. His interest in Arabia grew out of his love of history and of archaeology. Lawrence wanted independence for Arabia but also craved fame for himself. His book Seven Pillars of Wisdom (first published in 1922) chronicled the Arab Revolt. It seldom downplayed what he regarded as his own crucial part and the book helped make Lawrence famous. The 1962 film turned Peter O'Toole into a star - it also made the Lawrence myth even stronger. Two years earlier, Terence Rattigan had written the play Ross which also focused on Lawrence and which had starred Alec Guinness. It gets a rare revival at Chichester next month, with Joseph Fiennes in the lead role. At Hampstead, Lawrence is played by Jack Laskey, familiar from the ITV series Endeavour. He says he's seen only clips of O'Toole's performance and has tried not to think of how other actors and other scripts have seen the man and his deeds. "It has to be our interpretation of his character or it won't work. It's all there in Howard's script, supported by reading about him and reading what Lawrence himself wrote," he says. "I'm still getting through Seven Pillars of Wisdom, bit by bit. It's a long and fascinating account of the era and it's beautifully written. "There are so many contradictions. He wanted to be in the spotlight but also wanted to remain unknown. It's clear he felt guilty because he thought he'd betrayed the Arabs in the war - that he promised things London would never have let happen. He has to atone for that. "He's angry at his country but perhaps also he's angry at what he has done and not done personally. There's a lot there for an actor to work with." One of the aspects of Lawrence which has been discussed more freely in recent decades is his sexuality. Laskey says it's not the focus of the play but it's something he needed to think about. "In Arabia he found a much greater easiness about male affection and he enjoyed that. He writes about that intimacy in Seven Pillars. Some people believe he was basically asexual but it's not something the play really has an opinion on. "But it's clear he discovered a new freedom in Arabia which I'm sure was part of his genuine love for the place. "For him Arabia was a place he could hide himself. There's a lot of stuff in the play about fame and celebrity and the problems it can bring. It's one of the echoes you'll find of our lives today." Playwright Brenton says it's important to realise Lawrence had an artistic temperament. "But he was a fighter too - there were times when he'd had to kill and had not hesitated. Writing about damaged things and damaged people can be rewarding. "Though I don't know the Rattigan play I have seen the Lean film, which people sometimes now mock. In fact the screenplay is good on this strange mixture of strength and vulnerability. "I think TE Lawrence had an unexpectedly naive or innocent side which allowed him to do extraordinary things. Napoleon Bonaparte had the same trait." Brenton says it would be foolish to assume Lawrence's hopes for the Arab world would, if they'd become reality, have brought permanent peace to the region. "Who can say how history would have changed? But his main point was pretty simple: that if after the war the big European powers imposed new boundaries which crossed lines of tribe and loyalty it was asking for trouble." Lawrence's life ended in middle age far from Arabia. He died in 1935 in Dorset following a motorbike accident. Since then, some have thought him a major writer; others think him at most a footnote to the latter days of Empire. Brenton says, writing his play, he came to like Lawrence more. "There are people who dislike him intensely and are totally iconoclastic about his reputation, which they consider inflated. "But I think he was an extraordinarily interesting man who was torn apart by Britain's imperial dilemma. For me that made him worth writing about." Lawrence after Arabia is at the Hampstead Theatre in London until 4 June.